As someone who posts her work through a web interface, I've learned the hard way to write my stories offline. More than once, I've lost a post when a server or an Internet connection went bellyup. After several losses in a row, I decided enough was enough, and I went searching for a text editor. I chose Markdown Pro because of its clean interface and a basic feature set. Markdown Pro is a plain jane editor that opens with a blank canvas for your documents and a few tools on the tool bar for changing font size and finding items. It is designed for you to focus on the unadorned text and not prettify what you are writing unless you are using markdown for that purpose. There are a handful of keyboard shortcuts that'll enter the markdown for you, but markdown is so easy that I find it easier to just type the syntax by hand or use TextExpander to enter it for me. The app offers several different views, which are useful for previewing your document as you write. I choose the two-pane view so I can write markdown on one side and view a preview on the other side. The preview shows the formatting of the text, images and even YouTube videos. There's also a single pane view that is useful for longer bodies of text and a presentation view that shows only the final formatted document. 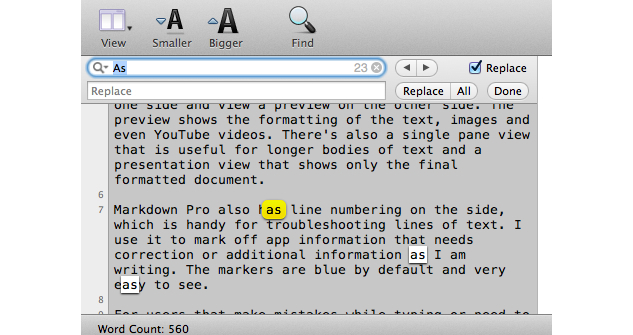 Markdown Pro also has line numbering on the side, which is handy for troubleshooting lines of text or code. I use it to mark off app information that needs correction or additional information as I am writing. The markers are blue by default and very easy to see. At the bottom is a word counter, which is useful for writers who have an essay that needs to be a certain length. For users who make mistakes while typing or need to change repetitive pieces of text, Markdown Pro has an easy to use search and replace feature that counts the number of found instances and highlights them in the document. If I need to replace a "--" with a "-", I can search and easily see which items will be replaced before I hit the "Replace All" button. The app also has a handy auto-save feature that has saved me countless times when an app has locked up and I've been forced to reboot my Mac to get it back working again. My only criticism of Markdown Pro is that it is long overdue for an update. When I first started using it, it was fresh off a new version, but that was almost two years ago. Some features broke with Mavericks, most notably the "Save PDF" button and the "Export as PDF" command in the File menu. I wonder what will become of the app when Apple releases the next version of OS X sometime this year. 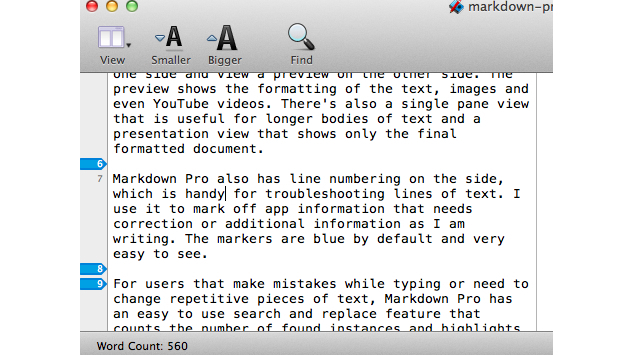 Markdown Pro is an OS X-based markdown and text editor from RADSense Software. It is available for US$9.99, but it often goes on sale. If you have an older version of OS X (Mountain Lion or older), then I wouldn't hesitate to buy Markdown Pro if you are in the market for a basic text editor. If you are on OS X Mavericks, then you may want to wait until the app goes on sale or look for an alternative that is still being updated. If you use another text editor, please share your favorite choice in the comments!